The Museum of Modern Art (MoMA) is working to extend its reach by creating a new “Digital Member Lounge.” Many museums today have struggled for the simple reason that visitors must come on-site to view collections. 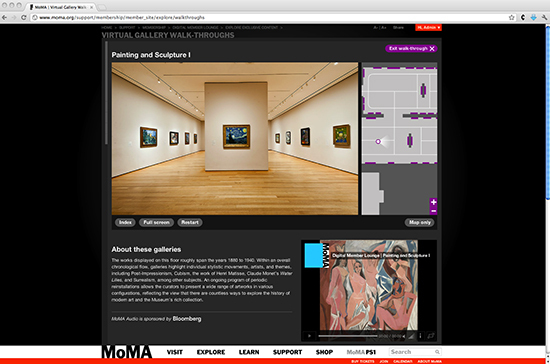 But as we’ve entered into the digital age, MoMA has realized that it must follow suit. The MoMA Digital Member Lounge is being implemented in hopes of expanding the museum’s audience as well as continuing to form deeper bonds with those who have visited it in person. Its functionality includes digital tours, recorded videos of gallery talks, and even previews of upcoming exhibits. One of the important things for MoMA going forward into this new venture will be to make sure that both online and in-person experiences are distinct yet valuable. Visiting the museum’s Digital Member Lounge must be a different experience from going to the museum, or there will be no significant benefit. That is why a key component will be for viewers to be able to listen to a curator comment on exhibitions. The Marie-Joseé and Henry Kravis Chief Curator of Painting and Sculpture, Ann Tempkin, has recorded several videos to introduce exhibits and give insight into artwork. The availability of these videos will make the digital experience a valuable and powerful one for viewers. We’ve previously profiled Henry Kravis as well as his wife, Marie-Josee Kravis (nee Drouin), for being valuable contributors to NYC’s culture scene. Currently the Virtual Gallery Walk-throughs feature four separate exhibits: Painting and Sculpture I, Painting and Sculpture II, The Abby Aldrich Rockefeller Sculpture Garden, and Edvard Munch: The Scream. As time goes on, more exhibitions will be available for walk-throughs.